LED home lighting is becoming the new standard for the future. Even Philips has stopped further research on the European well-supported fluorescent bulb, focusing instead on solid state fixtures. It is estimated that by 2020 LEDs will supply around 90% of the lighting fixture market. Developments have been made in both increased light output and lowered cost. However these benefits seem to be a little slow in filtering through to the home owner. Design for LED lamps is improving. Yet as one seeks on-line for available products many of the early versions are still being off-loaded. If style does not bother you then you can readily pick up relatively cheap multi-studded bulbs. There are some encouraging signs. I have placed some useful links for some top designs nearer the bottom of the page. Like the well-known Moore's law for computer power, there is a similar Haitz's law for LEDs. Light output from them is doubling every 36 months, giving a one hundred times increase over ten years. Therefore going on the wattage rating for an LED home lighting product will not be comparable from year to year. The best way to relate it I find is by using the comparison they give for the equivalent tungsten bulb rating. Unless you understand or can remember what lumens mean. 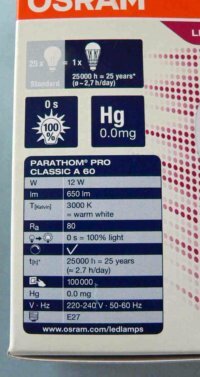 For those from Europe legislative changes that came into effect on September 1 2010 enforce primary labelling in lumens, rather than watts which represents the power consumed. 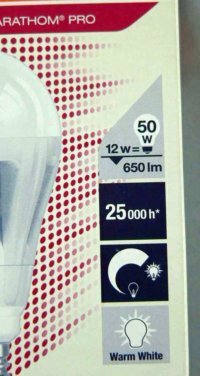 The guide they gave at the time was that a bulb claiming to be be equivalent in illumination of a 60W tungsten bulb should have a minimum output of 700-750 lumens. Labelling can vary as seen on LED home lighting bulbs sold locally. The illumination equivalent is higher than that stated in the EU ruling. In comparing these bulbs here shown, to the naked eye the light output appears greater than nearby standard tungsten equivalents. Lumens are the metric equivalent of the foot candle - the light registered at a foot from a candle. Lumens being in metric units is the equivalent of a candle power at one metre. This is different from measuring the actual power output at source which is the radiance in candlepower, or candela in SI units. Due to these variations and legal changes occurring I have included a table to give effective equivalent values for those of us who still best understand the older values of the tungsten lamps. Unlike compact fluorescents dimming LEDs is not a problem. Such applications are readily available. But higher than recommended supply voltages, which produce exponentially increasing currents in the units are lethal, massively shortening LED bulb life. Beside the long life of regular light emitting diode lamps at 50,000 hours or so, they are also very rugged - stable to shocks and shaking. Turning them off and on frequently does not shorten lamp life. There is effectively no lag time from when they are turned on to when they reach full brightness. Which has made them useful in automobile stop lights. Another benefit from this is the possibility of using LEDs to transmit digital data to enable wireless routing for computers and other communication equipment - a type of Li-Fi. This could free up the increasingly clogged radiofrequency medium. Even a direct line-of-sight is not necessary for LED home lighting to transfer data. Reflected light from walls and other fixtures will produce effective communication. The rate is so fast it is not picked up by the human eye. Nor does it seem to cause the unwanted effects of fluorescents for those people sensitive to flickering signals. At present researchers are achieving data transfer rates of 130 megabits per second. It is felt that one gigabit a second should be achieved in the near future. And there is talk of being able to reach ten gigabits a second. Unlike radio frequency signals, they cannot pass through walls. This gives some added security, although people would need to be aware of the risk of transmission through light transparent areas like windows. Cost of the LED bulbs is signficant at present, affecting rapid uptake. The bulbs can last fifty times as long as incandescents and many times longer than the compact fluoresent bulbs, making them cost effective over their lifetime even now. More so with their much lower power consumption for the same light output. In mid 2009 Cambridge University managed to produce LEDs twelve times as efficient as tungsten fixtures at around US$3.00 each. Again it is taking some time for this to filter to the public. Cree Inc has just announced a new white LED light that produces 148 lumens per watt in the cooler (bluer) light and 114 lumens per watt in the more warm colour. 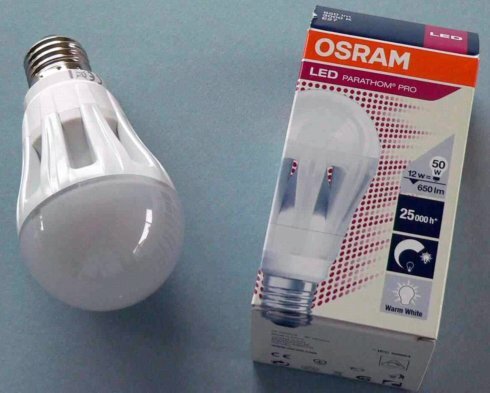 This more than doubles the output shown in the pictured Osram bulb. Again at the end of 2012 they announced breaking the 200 lumens per watt barrier! Those waiting a while to change to LED home lighting will benefit from these new developments. LEDs with their solid state diode structure produce light very efficiently from the current applied. However the crystalline structure interferes with benefitting from the full expression of this. There is a significant refractive difference at the interface of the crystal with the air about it. With a flat exterior surface this allows the light to penetrate through only at a very narrow angle. The remainder of the light is reflected back into the crystal converting its energy to heat. Especially a problem with higher powered units, excessive heat vastly decreases the life of the structure. If the outer surface is built as a sphere with the light origin at the centre then a much greater percentage of the light will pass through. A similar hemisphere design (as above in the new Cree unit) with the light origin at the centre base will work well too. Otherwise LED home lighting products need to be constructed with a heat sink or similar diffuser to draw generated heat away from the active light-emitting junction. Being a semiconductor in structure, the current will flow only one way. To overcome this when using an AC supply two elements can be placed in each unit allowing the current to travel through one of them in one direction and then through the other as the current reverses. Alternatively a control unit - or driver - can convert the current to DC - one of these can cover a number of bulbs in a circuit. Control units to convert the currents and limit excessive voltage create some of the increased costs in LED home lighting. Recently the Fraunhofer Institute for Applied Solid State Physics IAF in Freiburg has experimented with replacing typical silicon control transistor drivers with GaN (Gallium Nitride). Switching is ten times faster than with silicon and output can be doubled. The unit can be manufactured as a faster, smaller and cheaper component. LEDs tend to produce specific colours depending on the crystals and doping used. This is useful in traffic, other signal and display lights, but creates design challenges in creating more uniform white LED home lighting. To create white light, and especially a warm white light, a number of means have been employed. Mixing colours can be used. Osram is using converted green (using a ceramic converter that doubles the light output) and yellow together. Cree has used yellow and red lights mixed to maintain true white over their lifetimes. The latest developments from Cree Inc have been noted in the link above. Commonly at present blue and at times yellow light emitting diodes are set within an internally phosphor-coated bulb. The light causes the internal phosphor to glow white - similar to the technology for fluorescents. Detail of latest LED complete lighting unit with two tiny white emitters showing in the central field. Organic light emitting diodes (OLEDs) could be used in LED home lighting. With their thin layer technology they can be applied to even very thin paper-like structures. All sorts of new architectural designs for lighting become possible. One current problem in OLEDs for producing white light is that the elements that produce blue light have a shorter life, or deteriorate faster than other colors. The colour temperature of the composite white light changes over time. Organic LEDs also deteriorate in sunlight. Osram has developed a number of OLEDs including a recent one with 13 Lumens output per unit but a quoted life of only 6000 hours. For more creative LED home lighting I have mentioned in the more general page on home lighting that there are some great architectural styles provided by a company in Australia and New Zealand. For a New Zealand-based one manufacturing specifically for New Zealand standards, which have become tighter than Australian ones now, see the Superlux business. They design and engineer their own lights. Their helpful staff can guide you through a wealth of styles at their showroom in Auckland. There is a similar more architectural LED lighting company in the USA that is worth looking at. One of the market leaders in LED home lighting development is Cree Inc. They have a number of products available directly to the market as well as base units for lighting creators to develop. They have an associated site for stimulating discussion and promotion of the adoption of LED lighting. The LED home lighting field is in rapid development and thankfully more and better products are rapidly coming on line. In the last few months complete units have been produced for local sale. As shown in the last two images, they are using white emitter units, often from CREE Inc, with much improved design styles. One of the main lighting retailing groups within New Zealand has undertaken to be totally converted to LED home lighting by the end of 2013. With the long life of the emitters, home owners are more likely to be wanting to change to style of the units before the emitters ever need changing.